Rounding off our initial Golden Globes red carpet coverage with a whole lot of dudes in tuxes plus some other frocks which don’t quite fit into sparkles, bold block color or black and white categories. *waves back* Oscar Isaac really is the man of the hour and not only does he look handsome as hell in custom Rag & Bone, the curl and beard level is great AND he won for Show Me a Hero. Nothing bummed me out quite as much as the end of this David Simon miniseries and I mean that as a testament to the performance and the story. Plus Isaac managed to work a mustache and dad jeans. Not an easy task. Another winner from the night from both a style and award perspective; Jon Hamm you are a dreamy delight. 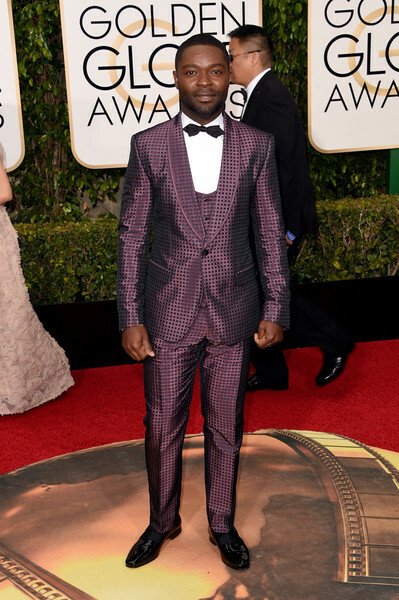 David Oyelowo was a constant highlight on last year’s awards campaign and he defies my sentiment that we were just going to get a whole lot of standard tuxedos in this purple affair. Aziz Ansari is another dude we can count on as he goes for a muted twist on plaid. Eddie Redmayne is also part of the fun suit clan and this Alexander McQueen subtle polka dot number is no exception. The lean is very much in full operation. Crush from the mid-90s and current crush both looking mighty fine all suited and booted. 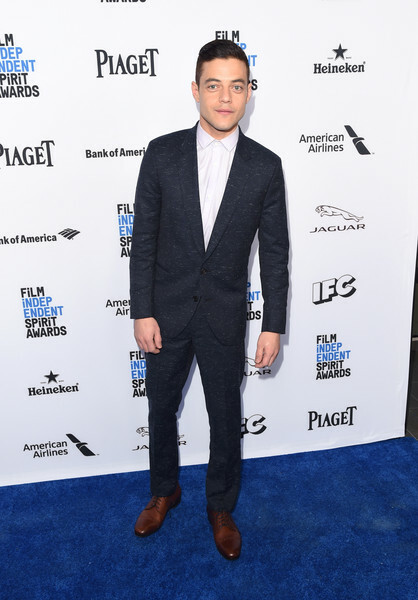 The cast of Mr Robot is one stylish group. #LadySuitWatch2016 kicks off to a great start with the always amazing Judith Light. This Givenchy frock has a slight boudoir air about it on the sweeter end of the scale to Caitriona Balfe and this might be a Cate Blanchett magical fashion unicorn scenario. Not a whole lot of pattern on the Golden Globes red carpet this year and Maggie Gyllenhaal gets more 30s inspiration in this beautiful Marc Jacobs dress. I heart everything about Maura Tierney so I was very pleased to see her win and that she wore her glasses up on stage. This seems like the best way to finish today’s Golden Globes red carpet coverage with a whole lot of Transparent infused chaos. Black and white frocks don’t have to be the safe choice as this next collection of Golden Globes 2016 red carpet highlights demonstrate. 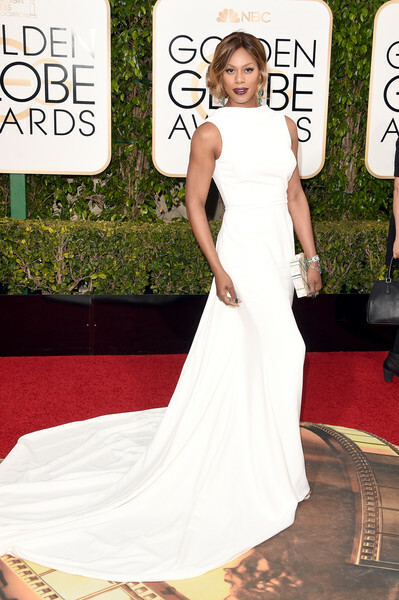 Laverne Cox is gasp worthy in Elizabeth Kennedy serving all levels of drama from her gown to her makeup. SO MANY CAPES THIS YEAR! All caps needed because Emilia Clarke’s Valentino gown is a vampy turn I did not expect from her. And for a softer caped turn we have Saoirse Ronan in ethereal Yves Saint Laurent couture. One of the ‘surprising not so surprising’ wins of the evening came from Lady Gaga (who thanked Matt Bomer first because who wouldn’t?) and she looks like a movie star from the 50s in custom Atelier Versace. I know some were underwhelmed by Alicia Vikander’s apron style pleated Louis Vuitton, but I am so here for it as it matches her general super chill vibe. And I think she will go big at the Oscars. This Alexander McQueen is a little witchy boudoir from Caitriona Balfe, but I am also enjoying this twist on a black gown. A train looks incredible, but it can also cause logistical problems with people standing on it as Taraji P. Henson found out when she went up to collect Best Actress; so I can see why she changed out of this Stella McCartney wonder for the after parties. It looks incredible here as she poses with her Golden Globe. Valentino featured big on our end of year “Look of the Week” posts and this is another excellent frock from this fashion house with Kirsten Dunst going full cleav. It is a shame she didn’t win for her Fargo role, but hopefully another project in the future will mean more Dunst on TV. For more 2016 Golden Globes red carpet highlights head here for sparkle and here for bold color. Oh hey! Fancy seeing you here for more Golden Globes coverage and after the all things that sparkle rundown we’ve got some bold color offerings for you to enjoy. America Ferrera was the first person I saw on the red carpet when I got in from work and I maybe yelled in joy at seeing her in this color (okay I definitely yelled) and it is a Jenny Packham ray of sunshine. Ferrera was also part of one of the best parts of the show when she presented with Eva Longoria as they called out those who mix them up for other Latina actresses. Oh like how the official Golden Globes Twitter account confused Ferrera for Gina Rodriguez. Jennifer Lopez serving up full Hollywood glamour in a not quite mustard and probably chartreuse caped Giambattista Valli. The Shades Of Blue promos (which featured throughout the show) use of “You Don’t Own Me” reminded me of how much I want a First Wives Club remake staring Ben Affleck’s exes. Make it happen, Hollywood. The Golden Globes have a tradition of giving one award to a lady newcomer (including Keri Russell for Felicity, Jennifer Garner for Alias and last year Gina Rodriguez won for Jane the Virgin) and they repeated this trend with Rachel Bloom and Crazy Ex-Girlfriend (on the list of shows I need to catch up on). Both her speech and custom Christian Siriano gown are excellent. Last year Gina Rodriguez went a little safe and sedate; this year she has gone big in Zac Posen and she looks great. Plus, pockets! Okay so I definitely feel like I have seen this dress a bunch of times, but Emmy Rossum’s choice of accessories are helping give this Giorgio Armani Prive a boost. It was a quiet year for red on the red carpet especially when compared to last year’s Golden Globes. Welcome to our coverage of the 2016 Golden Globes red carpet coverage and while the actual show was pretty hit and miss, the style levels did not disappoint. We’ve got quite a few posts coming and kicking things off is the big trend of the night with all that sparkles. The best thing about this other than appealing to my inner magpie is how much variety there is with this theme. Let’s get to it and keep checking back for more posts. Even if Brie Larson hadn’t won her custom Calvin Klein is giving off all the trophy vibes in the best possible way. 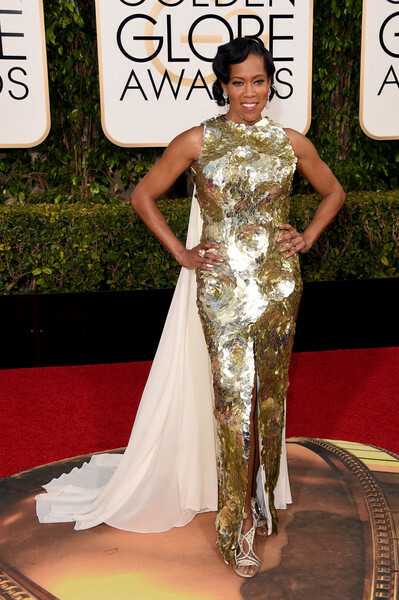 Regina King combines bold gold sequins with a cape in Krikor Jabotian and someone write a superhero part for her please. I’ve already seen this on some worst dressed lists, but I love it. Mr Robot won big much to my delight (late to the party, but I just finished it yesterday) and Portia Doubleday is going full disco ball in this stunning Naeem Khan frock. 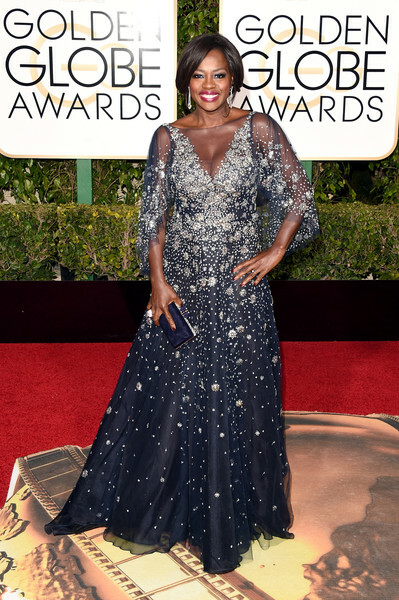 Moving into the shades of blue and Viola Davis could light up a galaxy in this starry eyed Marchesa delight (not something I say very often about Marchesa). Sorry Channing and your Gambit hair, it’s all about Jenna Dewan-Tatum in Zuhair Murad Couture. Also ticking those all important pocket boxes. During Bryan Dallas Howard’s interview on E! she revealed that she bought this beautiful Jenny Packham frock from Neiman Marcus because as a size 6 (size 10 UK) she doesn’t get all that much choice for events like this, which is sadly not surprising and maddening all the same. It does show that off the rack is just as good as the sample size offerings that other stars are privy too. Julianne Moore came with Tom Ford and is wearing Tom Ford (A Single Man rewatch is on the cards) and she looks like she has time traveled from an amazing 1970s party and is somehow making the velvet choker aspect work. She truly is magical. More sartorial treats from the Mr Robot cast and these ladies have been killing it this weekend with Carly Chaikin going part mermaid in iridescent Juan Carlos Obando. Custom Michael Kors for Olivia Wilde and she’s switching out emerald shimmer for burgundy and it is just as mesmerizing. There was a lot to love about Wilde’s red carpet styling in 2015 and it looks like this year is no different. Rounding things out is Amy Adams offering up sparkly accents in orange Atelier Versace proving you can be a redhead and wear this shade. Stay tuned for more Golden Globes red carpet posts and for a look at what we loved last year head here. A prelude to the main event tonight and two more daytime shindigs with the BAFTA awards season tea (with actual tea and for some reason a no selfie policy) and the 2016 Film Independent Filmmaker Grant and Spirit Award Nominees Brunch. Not quite living up to the sartorial offerings from the AFI Awards luncheon on Friday and this was a big case of scroll down nightmare when going through the photos; however there are still several outfits to love, some I am still not sure about and dudes in suits that are not black. By far my favorite look from the day and Alicia Vikander is high up on the most anticipated list for Golden Globes dresses tonight. This red striped Altuzarra is such a breath of fresh air much like most of her red carpet choices. Also going for something simple and cool is Caitriona Balfe in a belted tuxedo inspired LBD (with pockets!). Also reminding me that yep, I still need to get back on the Outlander watch. Nathalie Emmanuel edges towards maybe too casual, but also this is a really cute outfit so I’m gonna say it is more than fine. Still on the lookout for the perfect leather pleated skirt and this one combined with the white tee fits this description. The dash of pattern on her silk headband and bag also help make this outfit pop. Also this is all kinds of lovely. Digging the suit and grey sweater look on Mark Ruffalo. The jacket is maybe a tad too short, but I really like what Michael Shannon is going for here. Oh hey there Nyle! I really wanted you to win ANTM and yet I still haven’t watched the final episode (thanks Twitter spoiler for that). Glad to see him on the red carpet circuit and following on from Ryan Gosling wearing something from the brown palette. This is one of two dresses that I can’t quite work out if I like or not and there is so much going on with Priyanka Chopra’s Alex Perry frock (sounding a lot like Alex Parrish – her Quantico character). Maybe the top half should be stick to one black texture and that would make it seem less chaotic. Her face looks really great though. "The #BAFTAtea is always a great place for actresses to debut spring looks – despite the LA chill. It's clear orangey-peach will be having its moment soon: #SaoirseRonan, styled by Elizabeth Saltzman in London, dined a peach @LelaRose knit short sleeve and skating skirt over a Lela Rose floral shirt – while fellow Globes nominee #BrieLarson donned a cream pencil skirt with stripes of burgundy and peach, and a black top. The pair, both drama category front runners, spent about half an hour bonding at @BAFTA.” – @hollywoodreporter’s @merleginsberg at the annual BAFTA tea. #Getty For more from all the parties leading up to tomorrow’s #goldenglobes- visit pretareporter.com! Brie Larson and Saoirse Ronan are two more names on our most anticipated list for tonight and while I wasn’t enamored by either frock choice at this BAFTA event, this photo I adore. The second of the ‘on the fence’ frocks and Rooney Mara wore this to both the Film Independent Spirit Award brunch and the BAFTA tea – wearing the same thing to two events when you are attending this many is beyond fine in my eyes – and it is definitely very Rooney Mara in both color scheme and style. Definitely edging closer to love than eh. 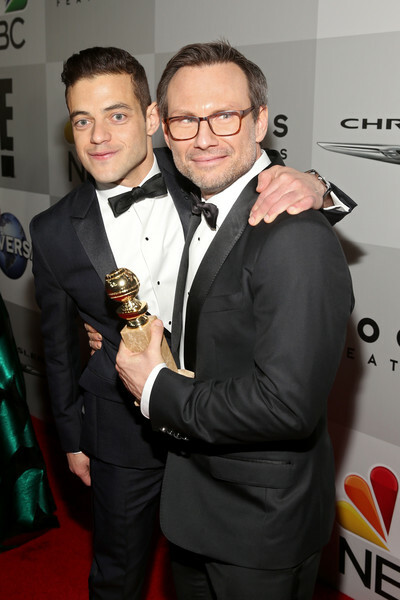 Yesterday I hit the BIG REVEAL episode of Mr Robot and while I was already aware of part of the twist, the execution and Rami Malek’s performance delivered and it didn’t really matter that I had been spoiled. Malek continues to go for buttoned up sans tie and I am so into this style choice on him. It is also nice to see him out of Elliot’s trademark hoodie.